Adriatic or Ionian (even the ‘small’ Ithaki has a surface of 96 square km). 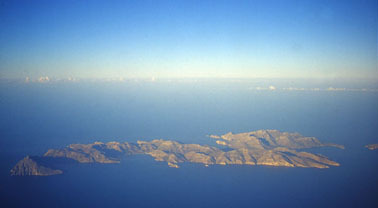 The closest islands are Nissiros (NW) and Halki (SE). 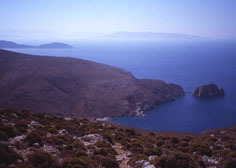 The Turkish peninsula of Knidos is also near, and can be seen clearly in normal weather conditions from the port of Livadia. Tilos can be reached from Rhodes in three to four hours by ferry, or in about an hour and a half by hydrofoil or fast boat. There is no airport. Like the other islands in the Dodecanese, it remained under Italian rule from 1912 to 1943, and it was finally unified with Greece in 1946. There aren’t many visible signs of the Italian occupation, with the notable exceptions of the building of the Port Authority (typical ‘Mediterranean’ fascist architecture), and of the very name of the island, that from 1912 to the end of the Second World War was Piscopi, probably due to a mistake by one cartographer. The name Piscopi can now be seen on an old Italian Army map, shown in Livadia’s main street, that was used by a professor of the University of York, who adjourned it and made probably the most detailed tourist map that can be seen in the whole Dodecanese. Quite useful, as the island is known specially for the beauty of its walks, that lead (not without a lot of sweating) to wonderful secluded beaches. island, and the reader is gently led to today’s Tilos. A few interviews with local people, and other sources, allowed me to reconstruct some events, from the war onwards. surrender to the Germans (this didn’t avoid him a trial and a death sentence from the fascist government of the Repubblica Sociale). 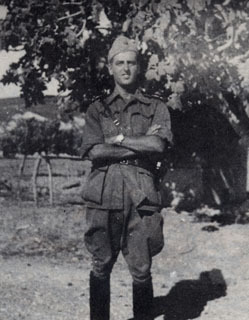 Dogliani, who was involved in capturing a German company, escaped to Halki, and from there to Tilos. People from other islands – suffering from the war’s starvation – got to know that three German motorboats had been sunk in the bay of Livadia by British aircraft. One of them carried a load of flour, in paper bags. Everyone knew that under salty water flour forms a thick crust, that protects the inside of the bag from the sea. So, boats from many nearby islands went to Tilos in search of the precious bags. According to some, the boat with part of its load could still be seen on the bottom of Livadia bay in the Seventies. Dogliani was fed and hidden by people in Agios Andonios, the second small port, near Megalo Hori�. 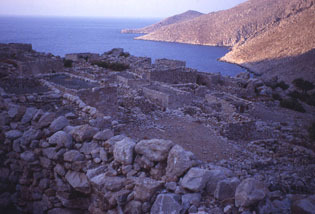 War in Tilos was similar to other small islands: occasionally commandos would disembark, make some damage and leave. At some point, hundreds of Germans disembarked in the bay of Thol�s, on the Southern coast, and reached Livadia. Few Greek patriots resisted with a machine gun: a monument near Livadia’s port reminds their heroic resistance. Probably later, a Cretan commando arrived near Megalo Hori� from the bay of Eristos, killed some Germans and left. German troops arrived, threatening to kill all inhabitants that had escaped, as this was evidence that they had helped the commando. Invited to translate, Dogliani (who, of course, knew German, though he pretended to be Greek) explained the German commander that it was dangerous to search the houses, as all patients had escaped the leper hospital near Eristos bay, to find refuge in their relatives’ houses. Hearing about leprosy disturbed the Germans, and then the commander was content with killing two lepers, guilty of having stolen boots from two of the killed soldiers. But the village was saved from more killings and fire. Of course, you won’t find any trace of the leper hospital in tourists books (it was close to the largest beach in Tilos), and very little is said also of the villages that were abandoned in the Fifties. One, Ier�, was a summer village for the farmers and shepherds of Livadia (at that time, the whole population): all houses (very small! ), with palm and fig trees, are still there, without roofs. A witness who was a child then told me that there was even a small tavern, in Ier� (probably the place where I collected a very old glass bottle of Peroni beer). Other small groups of houses were still used in the Fifties, in some cooler locations over the hills, like Pano Meri. 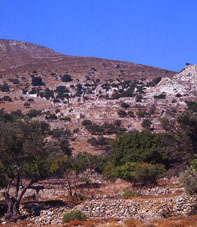 Traces of very intense agricultural work can be seen all around the island, with terraces apt to grow wheat and olive trees. Then, at a short distance from the port of Livadia, one can visit Micr� Hori�, that was also abandoned in the Fifties: not a seasonal village, though. It was a rather big village, with a church and many two-floor houses. The lack of water and the hard life moved the inhabitants to Livadia: since then, it’s a ghost village, with two exceptions. The old church is still used, and hosts a festival on August 14th, and one of the houses was restored to become Mikr� Hori�’s well known disco bar.